When my little sister Shirley and I were very young, mom always kept the cookie jar filled with her mouth watering homemade cookies. They were out of reach (ahem), way up on top of the refrigerator. "Wait till after dinner" she would say when asked for a cookie. Well, it didn't take long to figure out that if I pushed one of the chrome kitchen chairs (with the padded vinyl seat and back) up to the Formica covered counter top and stood up on the counter, I could reach that big old heavy brown cookie jar on top of the Frigidaire! But I'd only take 1 or 2, so (hopefully) mom wouldn't notice. One day, at about age 11, I accidentally broke the lid. Our old cookie jar then had a new use. It became our countertop "junk jar" (similar to the junk drawer). It held old keys, Top Value Stamps, shoelaces, matchbooks, pennies, a couple of screwdrivers, buttons, etc. Not too long after that, mom started buying this new plastic stuff. Tupperware. But wait, it gets worse. She started using one of those new fangled canisters for cookies. Store bought cookies! A few years ago, while browsing in an antique shop, I was thrilled to spot and buy an identical jar to the one mom had. A short while later, it came to me to look and see if perhaps, a logo might be stamped on the bottom. EBay was brand new to me then. Perhaps I could do an eBay search and possibly find a matching piece or two. Much to my surprise, I found a small assortment of what turned out to be Warm Colorado Brown Mar-Crest Oven-proof Stoneware in the daisy and dot pattern. I started buying Mar-crest piece by piece on eBay. Then at antique shops, junk stores, Goodwill, the D.A.V., estate auctions, yard sales, etc. My Mar-Crest collection / hobby / obsession eventually spilled over to my mother and her sister. Both of their houses are already full of shiny pretties from yesteryear. But now, when they're out together browsing the goodie stores, they always keep me in mind. And they've made some awesome purchases for my collection. The Mar-crest cookie jar that started it all. Rita, Thank you for the most informative website on this collectable stoneware!! I love it!" Karen S. in Clearfield, PA writes: "I just wanted to thank you for your web site - it is wonderful!! I remember eating off these "brown dishes" growing up at home and thinking nothing of it. I cannot remember any being broken but with 9 children I am sure some did! Then after I was married and we started frequenting yard sales, auctions, flea markets and EBAY..I started collecting "Marcrest daisy & dot brown dishes"..now armed with a name and lots of sentiment I have a wonderful collection. My mother said they were made available at the local A & P store in Pennsylvania and eventually she gave me the few pieces she had left after many years and many moves. Today I have given pieces to my 5 sisters and they are all appreciative. It is interesting to find pieces I never knew existed. I love dishes and amongst the Homer Laughlin Virginia Rose & Dogwood and Red Willow ware is the Marcrest. I bring them out in the Fall and we use them everyday even my 4 year old granddaughter! Thanks again so much for all the information in your site and wonderful pictures!!" K. Morrison writes: "I also have fond memories of the Mar-crest cookie jar. I have taken my mother's Mar-crest collection from my childhood and displayed it in my kitchen (high above little hands, of course). Now I am moving again. As I was washing them, my girls (25 and 18) and I (47) were giggling over how I used to try to sneak a few cookies out of the jar without mom hearing me. Both of them could get the lid off without making a sound, but neither could set it back on without making enough noise to catch my attention. Someday (probably soon, since both are getting married), I will pass on my Mar-crest collection to the two of them, so they can make memories with their own kids." Robin in Wayland, IA writes: "I started collection this summer and it is hard to find good information on Mar-crest. This [website] is the best! ... I went to a garage sale and there it was, an I am HOOKED! Now I spend my time in antique stores, thrift shops and ebay.. My husband wishes I had driven by that garage sale!" Eric A. in Midland, MI writes: "... I was so happy my mother gave me her set this year. I remember it only being used once on my 4th Birthday. I remembered how I thought it was so neat That we actually got to eat on it. Well my youngest turned 4 in Nov. and I had my family over and we ate on my new mar-crest. Charlotte E. in Sonora, California writes: "I have many fond memories of the Marcrest Pottery Factory in Monmouth, Illinois. We lived in southern Illinois and would travel to Monmouth, Illinois where my father would purchase truck loads of pottery and sell it at stock sales in Poplar Bluff, Missouri and other towns in southern Missouri. (These were the swap meets of the day, held at the stock yards). In the 1960's on my summer vacations from school mother and I would go with my father to the Pottery House as my father called it. It would always take my father a few days to purchase the pottery and load his truck. I was always allowed to wander the factory watching the clay molded, pressed, fired, glazed and fired again. It never seemed a problem for me to wander alone through the factory and talk to the employees during work hours. I look back now and find it strange that they would let a child of 8 years old roam freely in a factory with forklifts running everywhere. I had a few pieces of pottery that were my Mom�s and a wonderful piggy bank given to me in 1962 by the Superintendent of the factory. Last year my husband found another piggy bank exactly like mine. It was at the junk store owned by the county dump. I could not believe someone would throw away something I have treasured for years. The bank was in great condition with just a small chip on one ear, the same as mine. I was at a friend's house and saw that she had a Marcrest casserole dish, which my father called a dutch oven. I told her the story of summers with my father at the Pottery House. A few days latter I was given the casserole and she has also purchased me other items." Vickie S. in Texas writes: "I LOVE MARCREST. REMINDS ME OF MY LITTLE GRANNY AND OUR FAMILY REUNIONS. HER SISTERS ALL USED IT JUST LIKE HER AND THERE WOULD BE COVERED MARCREST CASSEROLES EVERYWHERE!" Linda Hudson of Murpheybird's Collectibles on Ruby Lane.com writes: "This line of dishes was introduced in late 1950's very early 1960's and my mom collected them from "Safeway". 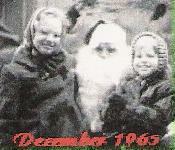 I know this was around 1959-1960 because I was there. I had to be about 6 or 7, not too much older. I can remember so well shopping with my mother in our home town, Mexia, Texas. It seems that different areas had different pieces." Anna H. in Jacksonville, FL writes: "I also have many fond memories of the "brown bowl" piled high with my Grandma's wonderful potato salad. Sharing many meals with my family in her home in upstate Pennsylvania where I was born. I began collecting the dishes a few years ago finding bargains at thrift stores, yard sales, etc. It helps me to keep my Grandma's memory alive in my heart." Pat J. from Cleveland, OH writes: "I remember my parents getting Marcrest as a child They went to the movies alot then and also shopped at 3 local grocery stores - Kroger, Pick-n-Pay and Fisher's." Lucretia from north east Texas writes: "I love the Marcrest also (the brown). My grandmother left me a few pieces about 30 years ago and I have collected every since. I just took my whole collection to my daughter in Pennsylvania Thanksgiving and she is now using it." Sara in Montana writes: "It's fun to know that there are other people out there that find this Marcrest stuff so irresistable. Years ago I found one of the big mugs at a second hand store here in Montana and it quickly became the only thing I wanted to drink coffee out of. I started keeping a look out for more but didn't really come across too much until I made the fatal mistake of checking out ebay. Oh, my gosh. I may have to redesign the whole kitchen!" Terry Lynn in El Dorado Springs, MO writes: "My Grandmother had Marcrest. I can remember it as a girl. She got it from Safeway in Tyler, Texas and had quite a set. The most used piece was the large "Tea" pitcher." Michelle in southeastern Wisconsin writes: "I had my Marcrest collection when I purchased my first home some 20 years ago. My father helped me collect pieces at auctions and I actually used them as my regular dinnerware. Alas, years later and children have brought me to Corelle. My boyfriend, who became my husband, used to call them Paul Bunyan dishes but he was always careful with them. I still enjoy finding pieces today and now that I realize the value, will continue to look for enjoyment and resale value." Shawn in Portland, OR writes: "Mom remembers that some Mar-crest pieces were free with grocery purchases from her local grocery store in Buffalo, NY. She shopped there between 1958-63. Other Mar-crest pieces were available, but had to be purchased." Sue Kenitzer of Golden, Colorado writes: "I used to go to Safeway with my mom when I was little. I would always tell my mom to buy this pottery because it looked like Chocolate Easter eggs. The Ziz Zag line and the daisy every so often. My Grandma used to laugh when I would tell her I wanted to eat on the easter egg dishes. I love it and have been collecting it quite a while. I don�t have any of the completer sets of place settings and have often wondered why they are not around much." EBay's pepperpassion writes: "I too attest that we got Marcrest in the local A&P food store... I even remember the display right in the middle and was kind of in awe when we "collected" a piece (even green stamps I think?) for our purchases but do know we had to buy some of them and my mom bought it with pride. And if you were invited to your best friends for dinner or a picnic, didn't you feel like you were part of their family when they served it in a comfortable and familar dot daisy dish? Our parents came from the bowels of the great depression, fought in the 2nd (and last?) Great WW and highly valued the prosperity their thriftiness had in creating the cornerstone of an American dream afforded them the proliferation of tract houses and suburbs, small town living and city lights savvy.... this was the epitome of "making it" then. I am sure there were many more "promotions" in that whole post war boom era...but Mar-crest was to me the biggest nationally.... we all had it, all took it for granted back then and now all love to see it and love it again as it transports us back to our youth. You can go North, South, East, West...all across the country and it isn't just a journey in miles but in time...we are all the same...we all had a common bond. And it came from the the heart and hearth of our Home. Mar-crest! Is it any wonder we are passionate about our collections today?" Larry in the Dallas/Ft. Worth, TX area writes: "My mother had two pieces when she died. I inherited the carafe and a large pitcher. That was 20 years ago and I now have over 100 pieces including (what I think is rare) a "lazy Susan" piece. My love and collection has grown for our favorite brown ware, but my two originals always have a place of prominence. I enjoy the hunt for new pieces and always hope to find one of the pastel lined pieces down here in Texas. I have not found one yet. My wife collects different depression glass sets for our daughters and I have my *Macho-ware* but not too sure if our son really appreciates the eventual outcome. Keep up the good web-site and thanks for providing it for us." Nancy in Gatesville, TX writes: "I have collected Marcrest for years. We use it for our "every day" dishes. Glad you have started a site for collectors. I probably have 500 pieces. Keep finding them at flea markets and garage sales." Debbie Silk writes: "My 86 year old mother collected Mar-Crest and yes, she had junk stored in the cookie jar, too! She got them at the local A&P or the Winn Dixie store in our rural town. She also collected the blue and white Currier and Ives from the A&P and the mirror brown Hull Pottery. As Mama got older, she divided her collections of dishes between my sister, my niece and me. I got the Mar-Crest, my sister took the Hull and she had enough C&I to give my niece and I a whole set each. We all still have our dishes and we all go hunting for our rare pieces, together. My niece and I go separate ways when we hit the antique malls because we both need the same pieces and whomever finds it first is the winner! I love my Mar-Crest and can see my Mama just digging through that cookie jar, now, hunting for her green stamps or change to pay the milkman!! Thanks for taking me back, Debbie." Jennifer in Indiana writes: "I remember driving by a garage sale on a main road. As I'm about to pass it, I spy what appears to be brown stoneware. OH MY GOSH!!!! Uuuuuuurrrrrggggttttt!!!!!!!!!!!!!! Whoa, horsey!! My heart starts beating really fast as I immediately brake as hard as I can. I still had to end up turning around. Darn it!! Will someone nab it before I get up there?? Whewww! They didn't, I made it!! Wow, I think. (At the time, I had only ONE piece.) A bowl and large dutch oven before my eyes. Snagged them up for $5 and $15, respectively. I was on a natural high all the way home. Lord, if I knew then what I'd have today!!!! My mercy!! So, you see, Mar-crest had me at "hello" :-) and has been a passion from the start!!" Denise in Chicopee, MA writes: "My now 90 year old Mom can't remember where her Marcrest came from. More than likely it was the A & P. She has been using the cookie jar for flour and the beanpot for sugar as long as I can remember. She had the salt & pepper set, but donated it to my Ebay auctions a few years ago." Martha in Auburn Hills, MI writes: "I have a very dear friend to my family for over 40 years and she gave me first piece for work that I have done for her in her home. I have seen some of these peices in your site and I am delighted to see that other have the same passion for this pottery that I have. I currently have over two dozen peices of my beloved stoneware and I am a faithfull collector. I have been collecting for years and am very excited to see your site. Thank you for enjoying this as much as I do!" Janice C. in Oakland, OR writes: "Hi, I just want to thank you for your informative site to stoneware that I stumbled across while doing a web search. :o) I recently bought a lidded piece at the goodwill for $2.99, and had no idea what it was. After reading your information, I now know it is a daisy dot lidded french handled casserole dish! I love it! It's my first time seeing a piece of the daisy dot (that I'm aware of). It has two small chips on the edge of the lid, but it makes no difference to me! You have some lovely pieces. Thanks again! Janice." Martha in TX writes: "Hello, I looked at your web site and am impressed. I started collecting in the early 50's. I am as old as Pearl Harbor (22days younger). My Grandma had me pick what dishes I wanted for my hope chest. She and mother helped me buy it at A&P Grocery store. Buy so much in groceries and you get a piece for under a dollar. I am smitten with your web site... Am so thankful that 3 daughters and 1 daughter in law love it and collect it too. Thank you for brightening my day with your web site." Joe in Cleveland, GA writes: "In 1959 my mother was shopping in Kroger in Chamblee, Georgia, when she found a premium being offered. Three piece place settings of brown stoneware called Marcrest were being offered at about $.98 per set with a $7.50 purchase. To Mom it looked sturdy and like it might survive her three kids. So, she started collecting the place settings, and then some of the serving pieces. We used that Marcrest as everyday dinnerware and serving pieces until we were in high school. Then Mom packed it up and carried it with us to Ontario, Canada, where we vacationed each summer with her family. The Marcrest was to outfit her cousin's cottage on the Trent River. The Marcrest survived removal to a new cottage on the same property, and then when her sister sold the property, it was boxed up and another cousin returned it to Mom in Florida. My sister quickly claimed it, announcing that it was very collectible. This would have been in about 1987-87. I thought she had a screw loose, but when I was shopping flea markets and antique malls, I began to spot an occasional piece. I found the first cup and saucer sets that we'd ever seen about 1993, then the salt and pepper set. Each birthday and Xmas, I was gifting her with my finds. Fianlly, I found "mint in box" the salad bowl with green plastic fork and spoon. My sister said...Joey, I just cannot store any more Marcrest, why don't you start collecting it? And I did!" "My partner, Lee Hull, recently opened (6-2007) a bake shop/cafe called Sweet Breads here in Cleveland [GA]. He serves his sandwiches and salads on Marcrest dinner plates and his soups in Marcrest soup bowls. This is the first instance that I have found where Marcrest is being used as restaurant ware. His shop is very upscale in our area, near Alpine Helen, GA. He offers various quiches, soups, bisques, as well as elk and bison meatloaf, and of course a wide selection of pastries. Marcrest seems to showcase his unique fare very well. I guess it is lucky I have collected so many pieces, though I shudder at the thought of a plate worth at least $5 or $6 being carelessly handled when he has over 200 china plates (mostly Nortake or similar) which he could serve on. But he perfers Marcrest!" Sherri in Wichita, KS writes: "We just moved my parents to a patio home and she was going to sell the Mar-crest dinner ware in a garage sale. I asked to have it instead as I remember on chili night, eating from these wonderful brown bowls. She gave them to me and even bought some "matching" pieces from the local antique mall to replace what had been broken over the years. We love them so much we are eating off of them everyday. 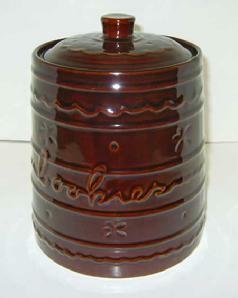 We have many of the awesome pieces, cookie jars, pitchers, handled bowl, divided bowl." Jean in Roswell, GA writes: "...a marcrest mixing bowl was our "scalloped potato bowl" loved it. it got "borrowed" at a family reunion, so I began looking for a replacement. watched the movie, Why Did I Get Married" yesterday. They seem to have an entire tabletop of marcrest in the cabin." Denise in Ridge Farm, IL writes: "My grandma had a large, lidded casserole dish that sat in her pantry cupboard. She told me that she often used the unglazed edge of the dish to sharpen her knives. She gave it to me over 20 years ago and started me on my quest to obtain more and more of it. I'm so pleased and excited to have found your site. I have well over 50 pieces of Mar-Crest and love it! Much of it is on display in my kitchen. Thank you for all the work you have done! Keep up the good work!" Kimberly Thompson writes: "My parents were married in 1956. One of their gifts was a set of Mar-Crest mixing bowls. There were three bowls that I can remember. After 35 years of marriage my mother decided the "western" look was more for me than her. As with all good decorating styles the western is no longer in my kitchen. The Mar-Crest remains. My collection has grown to service for 16 with many of the extras. My best friend began collecting these about 10 years ago. My daughter has just started collecting also. ( I'm really glad she did because she's so hard to shop for.)" "My Mom still can't believe how much I love "that brown stuff" that she used for so many years mixing all the good things we had as children.She is sad that her wedding presents are antiques, but happy she still has her favorite antique, my Daddy". Shari Jones in Waco, TX writes: "Growing up in Dallas in the 60's the Marcrest was a collection we got with green stamps. Our favorite piece was the bowl with the divider that my 3 sisters and I referred to as the potato/gravy bowl. It was the only one our mother had until the late 1980's when she dropped and broke it. She cried the whole day". "In 2006, I was searching ebay and I located 4 of those bowls from different sellers, all in exceptional condition. I gave them to my sisters and mother at Christmas, and when they all opened their bag, we all cried with the wonderful memories of many a meal served in that type of bowl, mashed potatoes and gravy, corn/green beans. The men in the room just sat and watched this crazy set of females crying hysterically over a piece of crockery, but we all agreed it was one of the most treasured memories we will every have of Christmas." Taylor in Moraga, CA writes: "Great site! It's near impossible to find info on this stuff, and it goes for dirt cheap on ebay - has such a good heft and feel to it, that i've begun picking it up at thrift stores-sold one, but just like it too much. Thanks for having such a great site!" Marie in Columbia Cross Roads, PA writes: "Wow, I can't believe that there is a site dedicated to these wonderful dishes. I don't think they are really the dishes but the memories they conjure when we see them. My Meme had many of the dishes and she passed away when I was 11 years old. As I got older and a family of my own my mom and me went into their attic and started going through boxes. I found several of my Memes Mar Crest. 3 or 4 different mixing bowls, mugs, and only two dinner plates. It was soon after that I started looking for Mar crest items. Every yard sale, flea market, antique shop that I go to the Mar Crest is at the top of my list to find. My 13 year old son was with me one day at an antique shop and when I picked up a bean pot he exclaimed "wow mom you found some of Meme Coutures dishes"! It is the memory of my grandmother that keeps me collecting and finding these wonderful dishes." Jackie G. in Houston, TX writes: "Growing up in New Orleans, LA, my mother always made our iced tea in the large Marcrest pitcher; it could handle the boiling water added to the tea bags. I am contemplating purchasing my first piece, a cookie jar, tomorrow from the Guild Shop, if nobody bought it today. Great site! I never knew that Marcrest came in pastels!! Thanks for your thorough work-up on this collectible!" Denise A. in Oxford, Alabama writes: "I was 5 years old & just learning to read. I alwys went grocery shopping with my Mom and would read labels in the store. For several weeks she had been getting 'the dish of the week' at the A&P store in Anniston, Alabama. When we walked around the corner where the dishes were, I asked my Mother if we were going to get some FRAGILE's this week, rhyming it with gaggle, or haggle. Over the next few monthe Mom got almost every piece of it, service for 8. I was always reminded that I called those beautiful dishes fraggles. Of course, in a busy household with 5 kids, many of the daily used pieces were broken. After my mother passed away in 1995 my dad called me next door to his house one day. When I got there he indicated a large cardboard box on the kitchen table on which was written in a permanant marker "FRAGGLE". Inside were the remaining Mar-Crest pieces. They are my prized posession. If any one piece is worth $1 or $1000, they are all priceless to me!" Send your Mar-crest Memories here. They just may be added to the site.